The combined trading volumes for all digital currencies currently stands near all time highs at $21.4 billion during the past 24 hours, just slightly lower than the $23 billion it reached earlier this month. Bitcoin accounts for nearly half of it at $10 billion, with ethereum and bitcoin cash combined handling another $4.3 billion. The next three by trading volumes are Ethereum Classic, Litecoin and Ripple, which in combination currently handle around $2 billion. Current top 16 digital currencies. All top 16 digital currencies currently stand above $1 billion, and all top seven are above $5 billion, a very first for this space since bitcoin’s invention in 2009. Interestingly, the market share of digital currencies other than the top four has been gradually increasing, currently standing at around 12%. Suggesting this space is seeing more variety and diversity as a long tail of cryptocurrencies potentially develops to meet their own niches or fund their own projects. 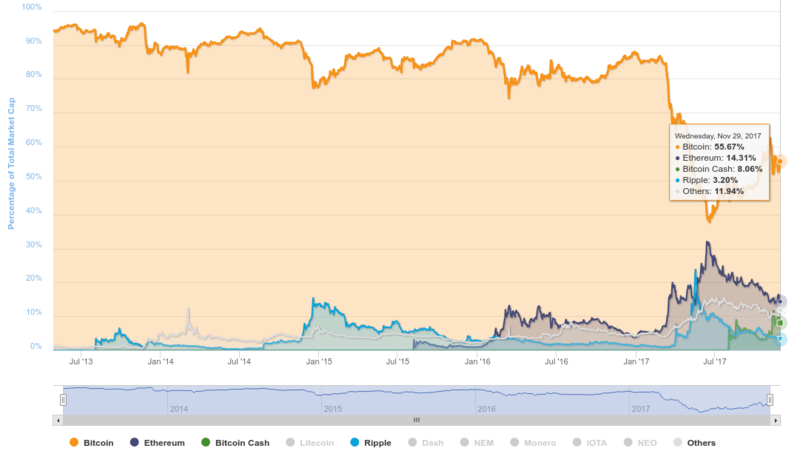 Current market share of digital currencies. Bitfinex stands as the top exchange by trading volumes at $2.8 billion despite it being unable to smoothly handle fiat withdrawals and deposits. Bithumb follows closely at $2.6 billion, with Bittrex, Gdax, Poloniex, and Biance then ranking accordingly as listed. One theme here appears to be clear. The exchange with most listed pairs appears to be most preferred by the market. Although there are exceptions, the market clearly seems to like the highest possible listing of pairs. They are struggling under heavy load currently as a boom the likes of which we have never seen before seems to have hit its peak so far, but whether this peak will seem like a blip in a few years time, or the height of the mountain, remains to be seen as the crypto show goes on.